The Simpsons sit on the couch, but get sucked inside and come out as shredded paper. "I can't see dead people"
"Take My Wife, Sleaze" is the eighth episode of Season 11. It aired on November 28, 1999. The episode was written by John Swartzwelder and directed by Neil Affleck. John Goodman, Henry Winkler, Jay North, NRBQ and Jan Hooks guest star. "Homer and Marge win a motorcycle in a dance contest. 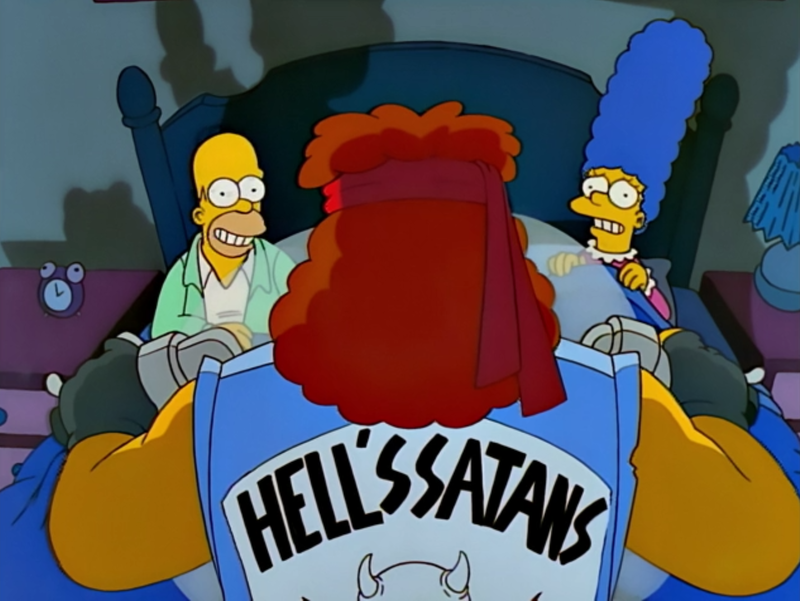 Homer decides to form his own motorcycle gang called "Hell's Satans". But there's just one problem - the name is already taken, and when the two gangs encounter one another, trouble ensues." The Simpsons are watching Guinness Book of World Records on TV. Lisa thinks the show is weird as there are stupid records now, such as the man with the least faces, none. An advert comes on advertising a new 50's styles restaurant named Greaser's Cafe. Bart and Lisa ask to go there and Marge and Homer also think it is a good idea. However, Homer says they will go next month, which they do. While at the restaurant, the owner, Wolfguy Jack, holds a nightly dance competition where the prize is a Vintage 1955 Harley-Davidson motorcycle. Homer and Marge enter and win the motorbike after doing all sorts of crazy dance moves. Homer doesn't know how to ride a motorcycle so Bart teaches him. After learning how to ride, Homer forms a motorbike gang with Moe, Lenny, Carl and Ned. They call themselves the Hell's Satans and cause havoc around Springfield, getting pictures in a motorbike magazine. Unfortunately, this alerts another motorcycle gang, also named the Hell's Satans, led by Meathook, who come to 742 Evergreen Terrace and trash the house and threaten Homer. They later kidnap Marge and leave. Homer goes after them and ends up at Poppa Wheelie's, a biker bar, where NRBQ were playing. He gets thrown out and beaten three times after unsuccessfully finding where Marge was. Meanwhile, Marge finds out that none of the Hell's Satans found her attractive, although she thought that Ramrod did. Homer eventually found out where their camp was and fought Meathook for Marge, eventually winning the fight after knocking Meathook down after effortlessly fighting while swinging motorcycles like swords. Modified on April 18, 2017, at 16:23.